Kay Scrivner, left, takes a break from working in the kitchen at the Irvine-Ravenna Kiwanis Pancake Breakfast Saturday at Estill Springs. 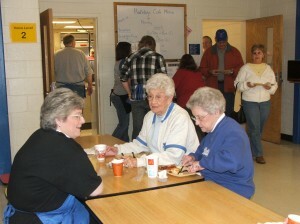 Enjoying their breakfast are Kathleen Honchell, center and Kay’s mother, Billie Scrivner. Kiwanis uses the money raised at this and other fund raisers to support the Kiwanis Park and Little League, Christmas for foster children, college scholarships for high school students, Key Club, Estill County Ministerial Association, Elizabeth Witt Christmas Party, Boy Scouts, Girl Scouts, Relay for Life, Irvine Cemetery, Friends for Life Organization, Parents Against Drug Dealing, highway cleanup, Irvine Health and Rehab, Salvation Army, GED tests and Early Childhood books.